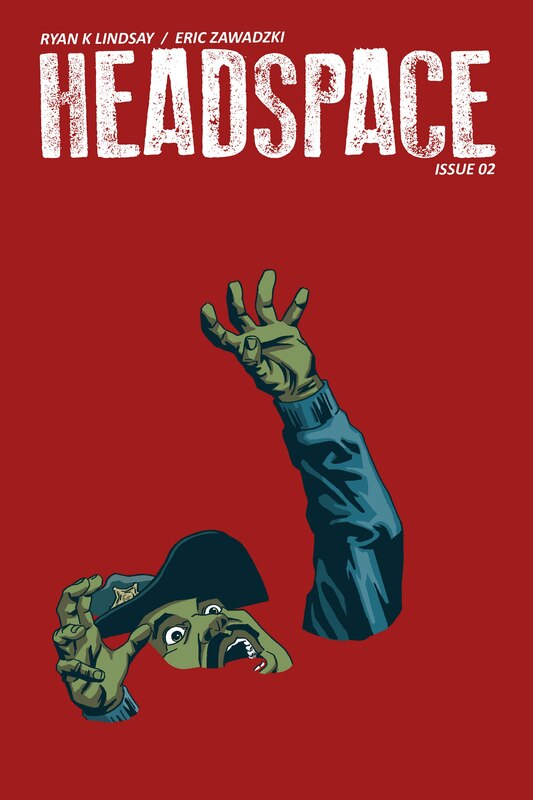 HEADSPACE #2 is up for preorder/subscription so I thought it might be a nice time to throw your peepers towards the interviews I did around the time of launch for #1. A lot of good sites took the time to chat with me about the book, its superb creative team, the influences behind it, and where/how I saw it playing out. I was especially pleased with so many fine questions thrown my way and I really try to ensure each interview feels fresh with its own vibe so stock answers don’t come out too often. Have a click through, enjoy, share, preorder, talk about, subscribe, and have a great day. Hope you dug all the info and tomfoolery. Head over to Comixology and preorder the second issue, or pick up the first for only 99c. You can found some review round ups with more superlatives here, and here. 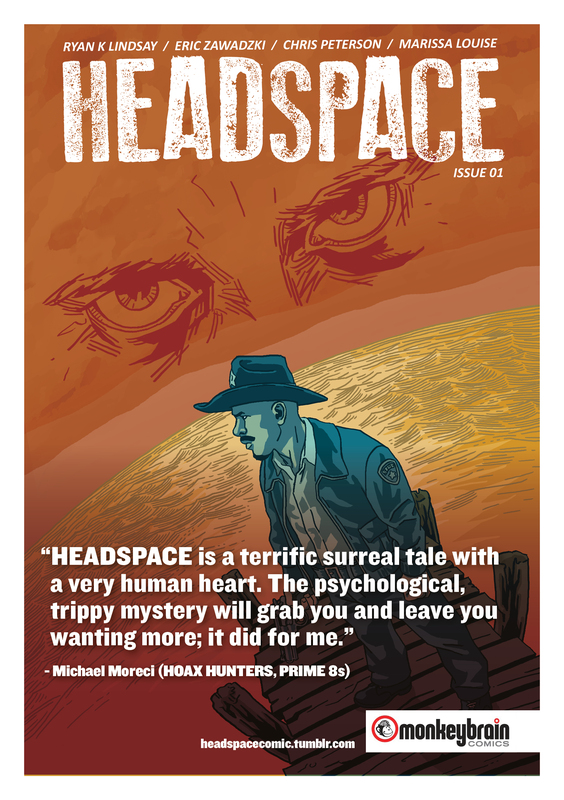 HEADSPACE #2 is available for preorder/subscription on ComiXology. I wrote it, Eric Zawadzki did pretty much everything else on the page. The issue goes live on Wednesday April 9th. This issue sees Shane meet the dead men of Carpenter Cove, come face to face with many faces of Max, and finally meet someone who can help him get out of the Cove…but can he trust the Librarian? This issue features a nasty alligator, one wickedly big gun, fatherhood issues, and possible hope for the future. There’s also some back matter chatter and an essay about THE PRISONER written eruditely by Dan Hill and designed like it’s your in-flight magazine by Chris Kosek. Preorder #2 now, and get stuck into #1 if you haven’t already for just 99c. I dig free things. I dig comics. When I find free comics, I dig like I’m headed for China. But, and here’s the rub, I find that people talk about all comics upon release and then kind of never again. Whether it’s amazing, woeful, high end format, or free, everything lasts for about 7 minutes and then gets washed away in a sea of tweets and likes. And I guess this is the way of the world but we live in, a time where some of my favourite new creators are making names for themselves and rightfully getting paid for it so I thought I’d point my wayback spotlight on some of their old, free, amazing work. Here are just some samples of free online comics that will blow your hair back. I think you’ll get out your shovel and start to dig with each link clicked. Enjoy. Yep, I still hate Ryan Ferrier. Digging through his free four colours and I realise how goddamn good he is. Some of these are some of my favourite things ever. SOUTHPAW – goddamn this is a good boxing noir tale. And I’m writing my own right now and I know I’ll always run second to this (second if I’m lucky). Bah. Plus, y’know, Kevin Zeigler and Neil Lalonde make one hell of an art team. I had the privilege to read the script for this before it was made and I instantly knew it was gold. The completed story only further went on to crush my soul. GODDESS – this short is stellar and should not be missed. Ferrier and Hugo Petrus craft this weird eco-battle-hymn that’s disastrously operatic and feels like when you first read Swamp Thing by Moore/Totleben/Bissette. TEAM GOLD FORCE 4 – so silly and yet so well crafted. There is literally no reason why a Golden Girls prequel fanfic comic should be this enjoyable but Ferrier and Felipe Torrent smash this. CLOCKWORK – a masterclass of 5 page shorts, and how to break into the game. Start small, write tight narratives to prove you can close. Enlist artists who can fit 5 pages into their schedule. Package it all together, hand out, but also make available online for free. The name of the game is exposure and profits aren’t in the vocab yet. Paul did great work here on many of these shorts, so click the link, incept yourself, and getting writing. Louie has been my co-pilot on a few shorts, most notably THE MANY HAROLD HOLTS OF SPACE AND TIME, and he’s got his own spectacularly innovative and beautiful online comics floating around. Scope this stuff and spread it around, then get lost down the sketch dump that is his site: Louie’s site. A LIFE IN THE CITY – holy cats, this thing is so damn fine. A side scroller, you really need to see it to believe it. THE CORNER STORE – another side scroller and by now, you’ll all believe Louie is the second coming. Hint: he’s better than that. My HEADSPACE spirit guide and life partner has a slew of pages available online for free and they are all gorgeous. Get in now so you can say you knew him way back when. THE GHOST ENGINE – I love this complete graphic novel from Zawadzki and Dany Djeljosevic. It’s well written, looks top notch, and it’s a complete story. I hope they kickstart a collection one day because I want it for my shelf. THE HARVEST – This is a short with Ed Brisson on the Challenger Comics site. It looks all funky and will make your skin crawl. A trusted friend, my editor on HEADSPACE (and other things), and a writer I admire. Dan understands story, and process, and the fact we all need to keep learning. He’s a zen master of process fu. He’s also a superb guy. COME WITH ME – this tale is nuts, just like the creative team. Invest in the fractured narrative, enjoy the flow, figure it all out as it happens. FLESH AND BLOOD – this grimy Viking tale is just fantastic. Ripe with tone and nasty intent, you’ll dig this slice of black heart on display. Some days I wake up wondering why I don’t have more Rob Harrington books in my life. The man writes a hell of a page. CLOWN FIGHT – this story is just about perfection. Deliciously funny, twisted, awesome, and so well paced. You need to read this. 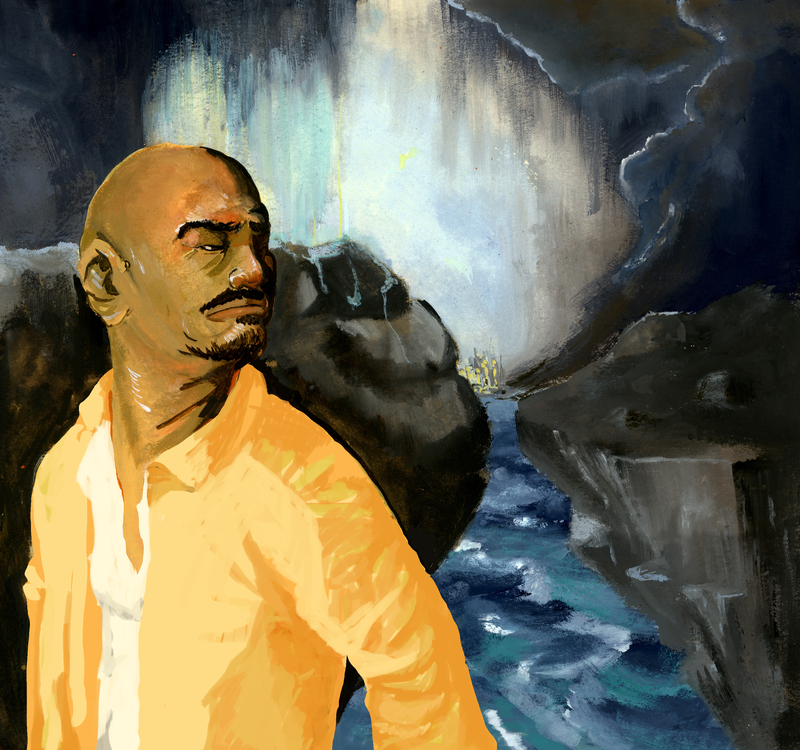 RAINBOWBEARD – this short on the Challenger Comics site is well put together and thought out. Download the PDF now. Yep, dollah sign Briss makes the list. Before tearing up Image books, Marvel crossovers, and every franchise taken from tv, Ed was pumping out his own product and quietly proving himself a master of the form. His Murder Books are the template for how many are doing the game of breaking in. Ed never asked permission, he just made his own damn comics and what crime masterpieces they are. Ed sold them at cons, kickstarted their asses (because IndieGogo’ed ’em doesn’t sound as boss), and he was also wise enough to put them all up online for free because he too knew the power of having work available for hungry peepers. Give ’em a taste now for free and they’re hooked for life later on. MURDER BOOK – every single one of these chilling stories will stick with you. Also, look at those artist names and tell me they aren’t all now titans in the field. Ed knows how to spot talent. Start with this link, the first tale, and then follow the rabbit hole down with the rest of the stories. You will not regret this. ACTION JOHNSON – Nic’s another guy doing it smart. He’s a letterer, so he’s meeting loads of rad artists, and he’s writing some very cool stuff on the side. This whole Action Johnson character/schtick pleases me, and the artists he’s bringing on for these affordable and sensible 5 pagers are amazing. Stay tuned for more because it’s most certainly coming. FORBIDDEN LOVE – dear lord, Arytom Trakhanov’s art is drop dead stunning. 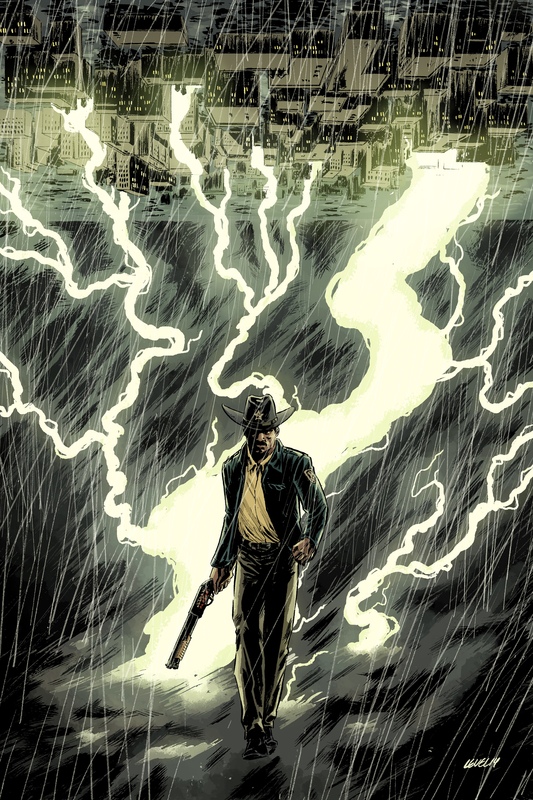 This short packs a short punch and is well paced out using panels and colours and gutters superbly well – click through for making the beast with two backs and two spurs, Western style. THE DARING ADVENTURES OF ANDROID JONES – another fun ongoing character, a pulp sci fi adventurer, with Ryan Cody art. Dig. And dig some more. Yep, I even get in on the action. And I’m proud of this story. SURVIVOR – a terrible sci fi tale that’s actually about fatherhood…which you probably saw coming. CAPTAIN HUMAN THE ROBOT – ALL AGES EDIT / AFTER HOURS EDIT – this whacked out jam comic i did with Jin Chan Yum Wai is some of the only comedic stuff I’ve ever done and I’m happy with both versions of this tale where the art is exactly the same but I wrote two completely different scripts over it. Hopefully, if things align, there will be more of this one day. If you know where any more free online funnies reside, drop them in the comments below, and share everything you like, and tell the creators, they’ll love you for it. Then go buy work by these creators if you dug their free stuff, because we’re all making other things and working hard to shake our four colour money maker for your pleasure. The 4 issue mini by Daniel J Logan, Brian V Dyck, myself, Dave Dwonch, and Justin Greenwood is available for purchase/download right now. And you can’t go wrong with 4 issues for $4! The story is: terrorists steal a time machine and send a bomb forward through time that will explode in Washington DC, but they won’t say when. 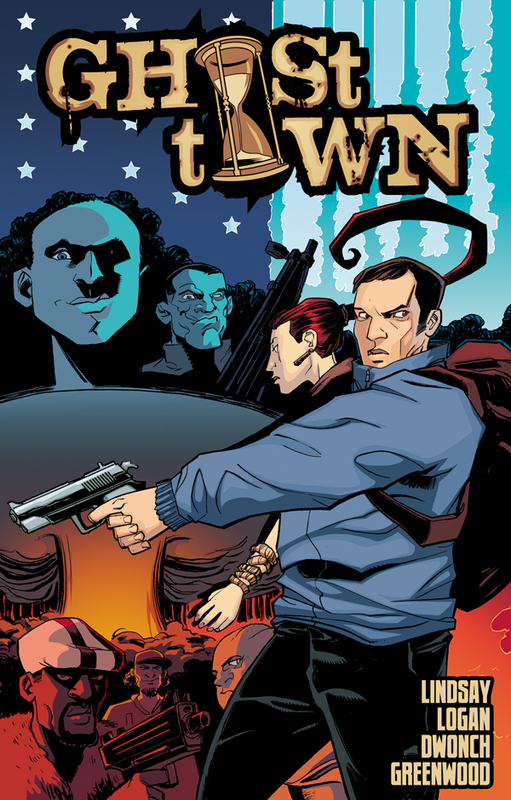 Rather than deal with them, the government evacuates its capital and Dan and I come in some time later where Nate Lawson makes his cash going into the possible blast radius and retrieving things left behind in a town now divided into ghostly fiefdoms. And on this trip, Nate is retrieving something bigger than he’s ever tried before. Business is about to get real. It was a fun book/story to work on so I hope you dig it and give it a chance. If you enjoy, let me know, spread the word, all the usual amazing things comic people do. 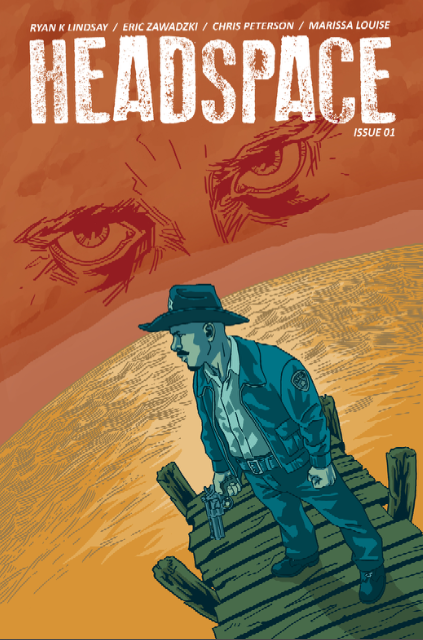 HEADSPACE #1 landed on ComiXology and the support and reviews have set my week aflame. It’s been nice to see people really getting and digging what we are doing. Now that I know they’re in on the gronud floor I feel good they’ll love where we take the story. I wanted to shine some love on the reviews because they took the time on us, it’s the least I could do. If you’re a review reader, enjoy, and if you are still on the fence for the book, let these fine literati peeps bring you into the fold. You can also scope all the Advance Reviews at this round up. If you still want to review the comic, just hit me up. 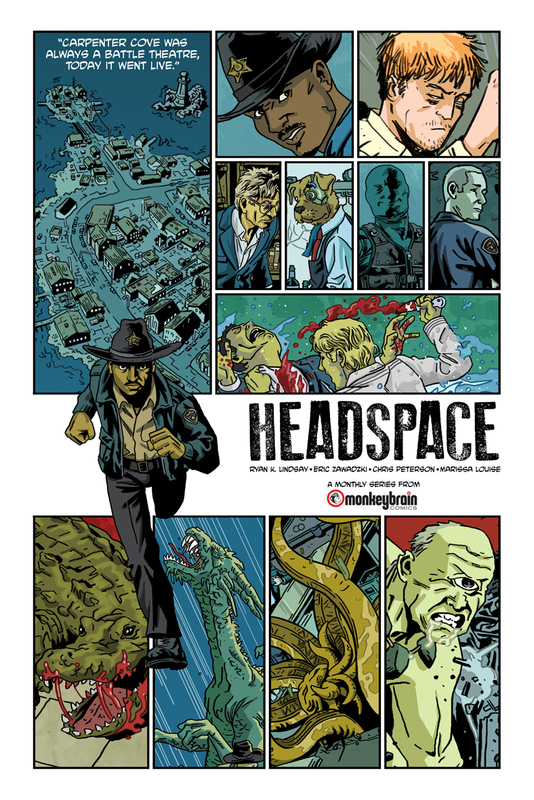 If you still want to read it: HEADSPACE on ComiXology NOW! Thank you all for getting it, digging it, and caring at all. Every review helps a small book like ours immensely. 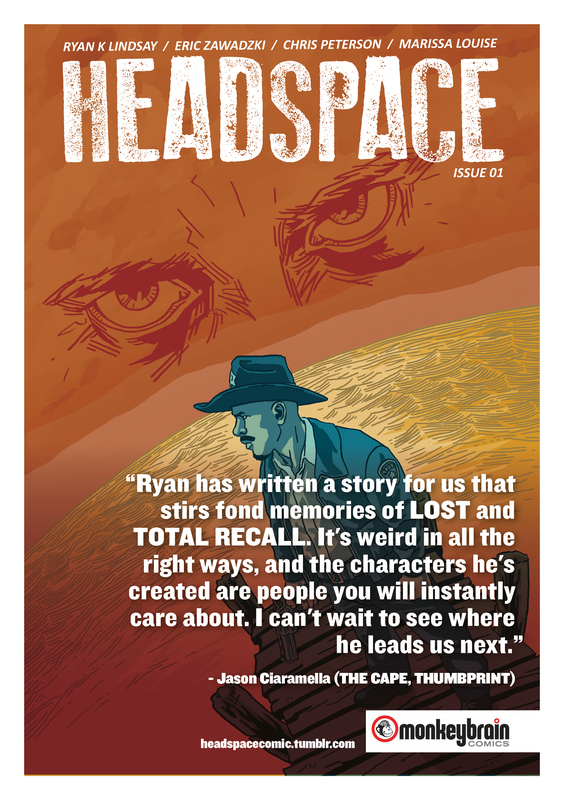 HEADSPACE #1 has landed on ComiXology and I could not be more proud of the work Eric Zawadzki, Chris Peterson, Marissa Louise, Dan Hill, Chris Kosek, and myself put into this beast. This is exactly the comic I want to read as well as create. This is my best work, to date, and as such I wanted to unpack a little of it for/with you. This wasn’t the first cover we had, nor is it the one we pitched with. That cover was good, this one is great. We were happy enough with the first cover but I think we all knew we had to launch stronger than that. I blame Ibrahim Moustafa and his insane work on the HIGH CRIMES covers each damn issue. So Eric went back to the drawing board and came back with this beauty. I love the angle and fishbowl style Eric brought to this new one. I love that both characters are represented. But mostly I love the colours, man, those beauties pop from anywhere in the room. This cover is truly iconic, hence me using it for all that pre-press and behind all the quotes. This cover is something to behold. I also found out, and this was only once we launched, that the cover works beautifully as a thumbnail on the ComiXology landscape. It stands out from the crowd, is easy to decipher, and Ryan Ferrier’s simple and dirty logo is readable at any size. When I wrote Panel One, I was firmly thinking of Dan Hill’s Opening Contract column. I guess you can tell why, and over time it only becomes more of a solidified thought. I like in media res. I kind of hope the audience doesn’t mind it. We don’t show the crime, we won’t show the crime, this isn’t what is important. Shane’s reaction and actions are what are important. I wanted to drop a fair bit of exposition into this first sequence but have it all be set in a sequence that also meant something else. Everything that happens on this page comes into play later. It is also a Rosetta Stone for the Shane character and what he’s all about. When I first saw this page, and the first panel with Shane in it, I was floored by Eric’s design of him in action. He’s so damn good. More exposition, basically because I want the status quo of Carpenter Cove established as quickly as possible so I can go about destroying it. I feel like other books/creators would have made these first pages the entire first issue, and established this world and these characters and then ended with the cliffhanger of things going all crazy. I couldn’t tread that much water. I do it in 5 pages and then get into the gristle of the tale. Again, I hope the audience doesn’t mind. I like a story that doesn’t muck around. Also, this sequence was initially written to showcase Shane, his stance, his actions, and his place in the Cove. But then as we broke the story I found a piece of this sequence and got to mine it for a moment later that’s just superb and I wouldn’t have got there if this sequence wasn’t already written and drawn. That’s some crazy narrative fu chaos theory at play. This page was written in because after some shuffling, I had a page to spare. And I am so damn glad this page got to exist. This page is just something else. That horizon. Those subtle circles in the water. The space. This is Eric just doing next level stuff. And interestingly enough, he thumbed a first pass at this page that was completely different and it’s one of the very few times I’ve ever asked for something to be changed and I’m so glad we did. His other thumb looked insanely good but it wasn’t carrying the emotion I wanted to convey. It was doing something else entirely, and doing it well, but it wasn’t where I wanted us at this page. Introduce Max. Man, if you didn’t dig the in media res of the first 3 pages then you’ll hate the entire Max sequence. Basically, no real information is given here. We don’t know who’s talking. We don’t know why. We don’t even know who Max is. And that’s kind of how I want you right now. Just rest easy knowing I know, and you will, too…soon. Also, how good are Chris Peterson and Marissa Louise together? I feel like I’ve paired these guys up and now someone else is going to steal them and use them elsewhere and I’m going to die of jealousy. And out of this whole page, which I love immensely, I can never get past that raised hand in Panel Two. It’s just so good. There’s kind of a big hint to something on this page but you won’t even know where to start looking for it. Good luck. I don’t even know what to describe those demon monkey creatures as. That’s all Zawadzki. So is the curvature on those buildings which just gives the creepiest effect. I still worry that those two ellipses in that final caption are too much. Oh, well, we must let go of our art. I love this page. This was the page that finished out our original pitch package and I think it’s such a strong beat. I originally wanted to show the spectacle of what was happening in the Cove and then I realised this all takes place in a brain, why not show Shane as well. That’s when the flying speed racer bike came into existence. I realised we can play with this landscape because why not? The Cove can and should be able to do anything so I gave Shane this crazy hover craft purely so he could witness what I needed/wanted to show the reader. From here, the bike has been a reminder to always drop the pulp when I can because it’s fun and creepy and better shows the Cove for what it is. As for the destruction in that big panel, man, isn’t it gorgeous? It looked great when we pitched but then Eric went over it after we got the greenlight and added even more insanity. That’s the sign of Zawadzki’s gift/talent/madness, he’s constantly wanting to refine to make it even better. And there’s one little thing in there that I saw and then instantly wrote into #3. The pacing on this page came out so well. This page is a masterclass in visual storytelling, everything progresses so damn well. And a lot of that was because of Eric. The whole use of that gun, and how perfectly its motions track, are on him. All I did was ask for the creature to be somewhat guided by Q THE WINGED SERPENT and I wanted those birds to look black because it felt creepier in that panel because to me they look like black pigeons, not ravens or anything. I wrote this page a few times. I wanted to get across that with whatever this is happening in the Cove, Shane is getting his memories of the real world back. This is where they start to bleed into his brain. I wanted it to be clear but not like I was spoon feeding. Treading that line is harrrrdddd. I dig the hoodie Eric gave the fire escape victim. Like some sort of updated Freddy Kruger hipster chic. Eric designed the whole middle of the page/flashback sequence. Again, Eric knows what he’s doing, I just have to stand out of his way enough so as not to hinder him. Again, I wanted to fit a lot into this page without destroying the frenetic pacing we were building. We should kind of be as abused and bashed around by these memories as Shane’s frantic mind no doubt would be. And then we end on another line I am proud of. Man, this bar. This. Bar. To me, this was Eric’s crowning achievement. This is proof he can world build and stage and deliver. This is my favourite location in this issue. Maybe even in this book. Look at that detail. Seriously, who wouldn’t love Gil? We finally cut back to Max and here we really see some of his true colours shine through. He’s a killer. Someone easy with dealing death. The ease with which he enters the fray was written to say a lot about him through his actions. He doesn’t get internal captions like Shane, and he doesn’t need them. The pacing of this shootout is so damn fine and it’s all on Chris, and the progression of Marissa’s colours from yellow to orange to red won me over the instant I saw them in the dropbox. This page appears to be just moving the pieces but I also wanted it to juxtapose against the previous violence. This is Max in another gear. We don’t understand it but we should note how different it all is. And I love how Chris sells Max’s movements and face, and then Marissa drops that green water and it should be a postcard…but we know it isn’t. I hope this page confuses you. But I also hope you remember it. It’s all important. I love the movie THEY LIVE so much. I also dig how Chris + Marissa fill a crowd, such unique individuals. I asked for that weird little inset panel and Eric really slays it. It’s this weird deadend of storytelling, if you think about it, a sideroad that leads to a freakshow attraction but then you have to drive all the seven miles back onto the main road to get back on the path you need to be on. It’s an appendix of panels, and it is fit to rupture. When Gil drops that line about John Sayles, man, Eric nailed the facial expression on Gil right there. That’s quality acting. The whole page is as Gil drops truth bombs. This reveal, of sorts, of the bar and the Cove is a very Twilight Zone sort of moment. I hope. This is where Shane kind of realises he’s in the story. And he still isn’t given all the clues to find the end of the tale but he is closer. I just hope, beyond Gil’s killer line, that you are paying attention in Panel Five. This is one of the few visual moments that came from me, and then Eric naturally kills with natural skill. And so things just kind of keep getting weirder. I didn’t want this issue to let up, I wanted it to drag us down the rabbit hole and then put a sack over our heads before we hit the thud at the bottom. But again, rest assured, everything you need is here and moving forward it all unravels. I love Max’s face in Panel Four, and that advert poster in Panel Five is gorgeous. When I scripted this, I wasn’t sure if I was being stupid or pretentious or ridiculous. But Chris nails the execution and I’m glad to have a silent (kind of) sequence where a lot happens and you have to piece it all together to really unpack it. It might not come at first but it’s all there. And then another advert Chris kills. He’s the Don Draper of the current comics world. The design of the killer is so damn creepy. Eric never fails, ever. I hope that final panel is a reveal, of sorts. I’ve seen it coming for so long that I honestly can’t even tell anymore. This page might be the thinnest in the issue, now that I’m looking over it all. But it’s still important and I wanted it to have these beats. This is, again, all about Shane. This helps us understand him. Look at those tentacles. And so Shane is not in a position to win, and he is lost, and that mayhem is right outside and inside, what to do, what to do…? That background red colour in Panel Two blew me away. That’s all Eric, and it’s genius. And he only gets better at it as the series rolls on. And with this final panel reveal, we come to a pause. A moment to breathe, if you wish. This was always the end of the first issue. Things were going bad for Shane, and we make them worse by the end, but with this last panel I wanted him to hit rock bottom. As a father, this moment here rocks me to my core. This is the sort of thing that strikes on many levels. And will next month. My aim was to make this issue breakneck throughout and then end on an even bigger note. I wanted the stakes to constantly be raised, whether it’s on a physical scale with the violence or on the emotional scale with that reveal. I wanted this to all trend upwards. Look at that phrenology page design Chris Kosek dropped on us all. The guy put in great time and effort to help design these pages so they’d feel special, and kind of like they belonged in a real (and real expensive) magazine. I am consistently amazed and pleased with the design fu he brings to the table. The structure for this back matter will pretty much always remain. A little wandering chat with/from me, some process stuff, etc. That’s the stuff I die to read so it’s what I want to offer. I hope the process hounds among you dig. I have read this issue so many damn times. And I’ve been pleased with it every single time. I went through this brief period where I thought it would tank with readers and then I got past it. I think I realised it might not take with some readers but those who would dig it would absolutely love it. This is the kind of first taste I want to produce, I want it to get right into the nuts and crackers of the narrative, I want it to cover some serious ground, I want it to raise questions and leave answers for later, and I want it to be about character as much as it is plot. I want you to come back to find out about Max and learn about Shane’s predicament as much as I want you intrigued about how anyone got inside the mind of a killer and what they are there to do. I hope you dug HEADSPACE #1, if so please tell you friends, put the love into the airwaves because these indie books only thrive on word of mouth and recommendations. If you know someone who digs subversive narratives with covert plot threads and bread crumbs to collect and follow then send them to the book, or send them my way for a chat. But share your love because that’s how we’ll make more of the magic happen. And if you didn’t dig the book, feel free to tell me why. Always happy to chat. And if you tweet your thoughts with the #headspacecomic hashtag then you might end up in the back of a future issue, if that’s your bag. 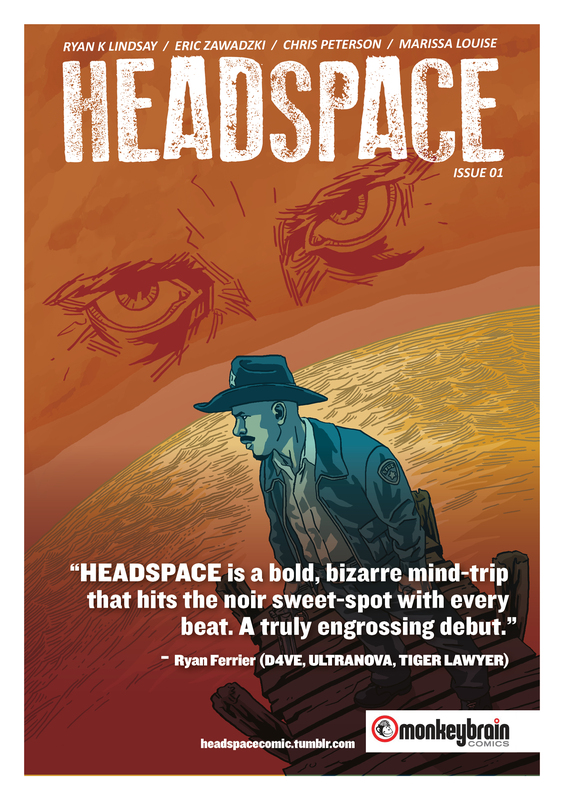 HEADSPACE #1 launches on ComiXology in a few hours so if you are on the fence here are some advance reviews, that are non-spoilery, that should help push the tide up into your click-and-buy peninsula. You can go to ComiXology and preorder/subscribe the book now. Preorder, or just buy, then tell your friends, talk openly about it online. Indie books survive and thrive through word of mouth so thanks for whatever you can manage for us. It is all appreciated. I am considerably floored by the fantastic things people made and said in honour of the launch of our upcoming book at Monkeybrain, HEADSPACE. We drop this Wednesday on ComiXology and so to boost moral in Carpenter Cove we commissioned this pin up by Brian – The Brothers James, Lazarus’ inks – Level. It’s intensely gorgeous. Then we had some friends say some nice things about the book and they went out of their way to be super nice. The cover/quote fu comes from Chris Kosek. And I must say, these quotes are all really sweet and I dig every one of them, and I also dig the media they mention as touchstone points because they’re all really good. And finally, we also got Marissa – our colourist supreme – Louise to do a pin up and the painterly sobriety she came up with floored me. So, we launch in a few days. Keep your eyes peeled for more pics and words on the HEADSPACE tumblr and then feast upon our delicious hard work on Wednesday as soon as your iPeepers will allow.